The end of the tall dresser build is almost here. One of the final things left to do, other than apply the paint, is to build the drawers. So that’s what we’re doing in today’s episode, it’s all about drawer construction. 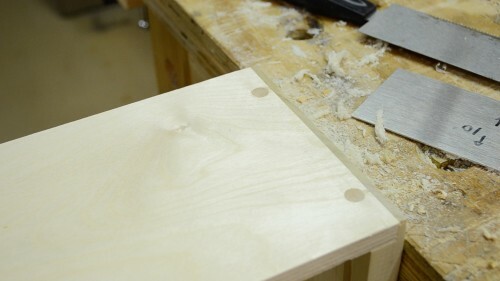 We’ll discuss dimensioning the Baltic Birch plywood for the drawer box sides. Fabricating the drawer runners that the boxes will ride on to keep them centered in their openings, not to mention how they’ll help to make opening and closing them much smoother. Then we’ll follow that all up with the construction and fitting of the pinned rabbet joinery we’ll use to assemble the sides to the solid wood drawer fronts. After today’s episode we have only one more to go and the entire construction of the 8 drawer tall dresser will be wrapped up and ready for the paint room. A full set of detailed plans are available for sale on my website, thanks to Brian Benham of Benham Design Concepts. You can find them by visiting our new “Digital Downloads Store” by clicking here. Now that the tall dresser is completed here’s your opportunity to see all the bonus footage originally exclusive to Patrons of Matt’s Basement Workshop. From my thoughts on the design process, to selecting and milling rough stock, assembling the components, and then eventually to finishing it all with milk paint and so much more. All this great content is now available to purchase and download, or rent and watch, to help you build this amazing dresser in your own shop. For more information visit my Video-on-demand page at Vimeo.com by clicking here. Hi Matt I think you’d get better results with the dowel pin holes if you increased the speed of your drilling and lessened the feed rate at first until the hole is is established to minimize your hole tearout issue. Also maybe try a nice sharp brad point bit? I liked the tape and template ideas too. I also appreciated the honesty with the drawerslide error. We all have been there at some point. I’m enjoying watching this process. thanks for the tip on the drilling speed, I actually have one more to wrap up so I’ll give it a try. I’m not so convinced they’ll be an significant issue with mixing the plywood sides with the solid wood front. Yes there will be some expansion and contraction, but from previous experience that wood movement isn’t as great as we tend to think it will be. According to the wood movement calculators for the average range of humidity swings our neck of woods experience (which are greater than inside my house) I should anticipate an average of maybe 1/32″ expansion and contraction over the year. That’s not so bad LOL. Thanks again for watching, I really appreciate it. Much of my confidence for mixing plywood and solid wood for drawers comes from previous builds of my own and others. I have a couple of pieces from over a decade ago that are actually a lower quality plywood dovetailed into a solid wood front. Aside from the hideous look of them, when I was first discovering my distaste for router dovetail jigs, they are holding together with no issues and the solid wood drawer fronts have yet to crack or break due to seasonal movements. On top of it, the drawer fronts were home center pine boards which are often notorious for not being as dry or stable as the stuff I buy now. I am glad to hear that ! BTW this was never meant to under mine your skills or knowledge of the craft ! I really enjoy watching your podcasts . The reason why I wrote to you was because I have ran into this very problem when I first started ( 15 years ago ) I used solid drawer front attached to plywood sides and sure enough , the next saesonal change, it cracked . I live near Toronto. Thanks Pierre, I actually didn’t take it that way, even if it may have come across as I did. I’ve been trying to add a little more detail to some my responses. It’s too easy to just say “okay” and leave it at that LOL!